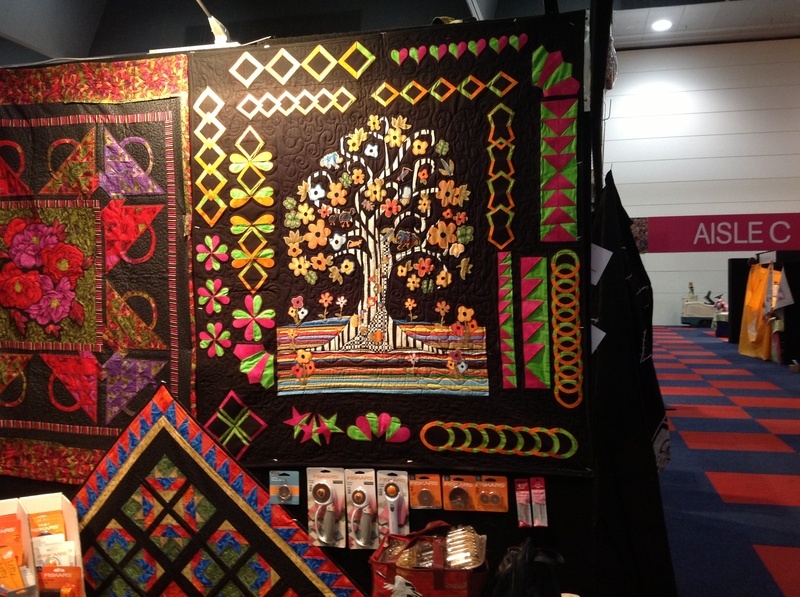 Flip-n Ribbons $20.00 RRP AUS and Flip-n Diamond Garland $40.00 RRP AUS or you could use the Dresden template in place of the Diamond Garland both the Flip-n Ribbons and the Flip-n Diamond Garland templates used to make this outstanding quilt - what an impact! This photo is not doing this template justice - Flip-n Kaleidoscope $40.00 RRP AUS finally I have had time to make a quilt with the template and it is definitely the easiest to sew - colour selection is the key to working with this one....see it at Darling Harbour. Flip-n Star Triangle $20.00 small and $25.00 large RRP AUS- this template is sensational - easy to put together the triangle blocks and gives a result of a star and a hexagon - I only had time to make a quick table runner - but totally enjoyed putting it together - easy to sew - easy to quilt - totally loved it - and you can see the prototype and the templates at Darling Harbour! Flip-n Ya Ya! $25.00 RRP AUS - this reverse applique is a bit of fun - totally easy to put together - interesting result when joined - just a bit of fun....you can see this new template at Darling Harbour.......see you at the show. 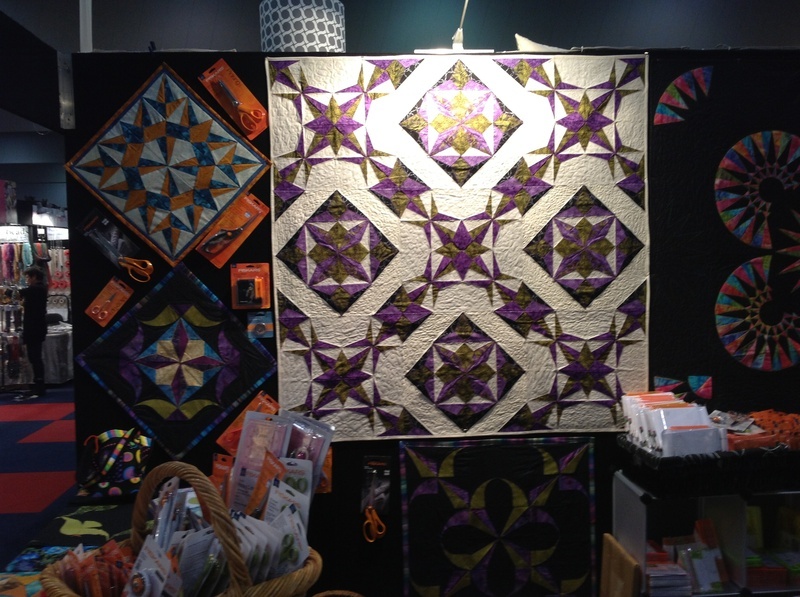 This Leadlight Tulip quilt was created with Flip-n Ying Yan! $15.00 RRP AUS template for the blocks and the Saw Tooth Border Template $40.00 RRP AUS - these two templates are the easiest templates to use and the most fun - we used scraps and leftovers from other projects to complete this quilt top and what a lot of fun we had creating the blocks with the Flip-n Ying Yan Template. t, Flip-n Rolling Pinwheels $40.00 RRP AUS template used to construct this beautiful quilt top - You can achieve flying geese or diamonds depending on how you cut your blocks out - great fun and a quick result. Flipways template was used to achieve this quilt top - the blocks were worked around the beautiful crane panel - I love this template - it so easy to construct and the final result is sensational. Flip-n Beauty Templates $40.00 RRP AUS used to achieve this quilt - the centre piece is worked using the Flip-n Beauty 2 template, the 4 corners are achieved by using the Flip-n Beauty 1 template and the 4 border corners are achieved by using the Flip-n Beauty 3 Template - this template has options which were used in the bottom left hand corner and the top right hand corner. Easy to construct the blocks and a pleasure to sew. This beautiful quilt was constructed using the Flip-n Baskets Template $40.00 RRP AUS and the beautiful Drama Queen range of Fabric by Fabric Freedom - truly a joy to put together and extremely quick. Flip-n Spin Template $30.00 RRP AUS used to make this quilt - lots of fun and once again a very easy template to work with - once constructed the quilt top appears to have many spinning wheels. Flying Geese - looks like they are migrating! Two new templates used in this small prototype - top left and bottom right are using the Flip-n Star Struck Geese template $40.00 RRP AUS - note the top left block has utilised the optional cutout in the middle of the block. Flip-n Geese Template $40.00 RRP AUS is used to construct the Bottom Left and Top Right Blocks - note again the bottom left block has utilised the optional cutout of a square. Lots of fun and I cant wait to actually put these two templates into a large quilt top. Flip-n Farmers Daughter $40.00 RRP AUS - this photo really dosnt do this block justice - very easy to construct and I am very keen to do a large quilt utilising this template - I can envisage the squares / diamonds and stars all floating across a quilt top. Flip-n Square Dance Template $40.00 RRP AUS used to create this Block - we have two other templates currently in production which we will bundle together with this template to make a fantastic series of blocks - this should be released for Darling Harbour in June.....cant wait to play with this one. 2013 Releases - see some traditional blocks created using the Flip la K process and templates - the design team had heaps of fun creating the templates and then constructing the blocks and quilts. My sincere thanks to Yan Pring for her continued inspiration. For months Deb has pestered me to make a sampler quilt - nice idea but using all the border templates ..... I was totally not sure how this would look.....In the midst of madness trying to prepare for Melbourne show ..... I found Deb and Yan sewing madly in the studio.....and what did they come out with....a sampler quilt....and what a sampler quilt it is....well done girls....I will have to eat my words. A fantastic collection of 10 Ten Templates that you can mix and match to create amazing quilt tops - each block is based on a 5 1/2" square - the pack of Templates comes with 59 different block ideas - 4 of the block ideas were used to create this quilt ...the Team have called this quilt "Ice Pallace".